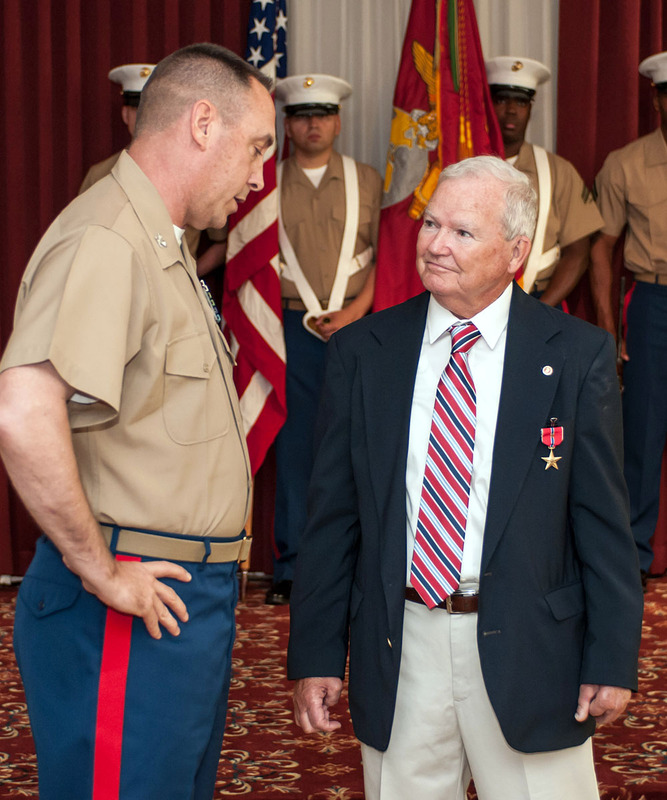 A 72-year-old was awarded the Bronze Star with combat “V” for heroic achievements during the Vietnam War. Retired Marine Staff Sgt. David Nugent, right, was awarded by Bronze Star with combat “V” for heroics in Vietnam. Nugent was recognized on Tuesday, nearly 46 years after he deployed to Vietnam during a ceremony aboard Hanscom Air Force Base, Mass. Retired Staff Sgt. David Nugent was presented with his award Aug. 26 aboard Hanscom Air Force Base, Mass. The former section leader with Mortar Platoon, Headquarters and Service Company, 3rd Battalion, 26th Marines, was surrounded by more than 100 family members and friends, according to an Air Force news release. Nugent’s unit came under attack by a North Vietnamese Army Regiment on Sept. 6, 1967. He was applying a tourniquet to a wounded Marine when an enemy grenade landed near him in his fighting position, the release states. Nugent disregarded multiple shrapnel wounds, including the loss of two fingers on one hand, according to his citation. He called for covering fire from an adjacent fighting position and then braved enemy fire to get reinforcements. According to the citation, Nugent disregarded multiple shrapnel wounds, including the loss of two fingers on one hand. He still called for covering fire from an adjacent fighting position, and then heroically braved withering enemy fire to go and get reinforcements. “I got about 10 to 15 feet out of my fighting position and started running and was shot in the leg … I ran a little bit further, then was shot in the hip,” Nugent said. He is credited with helping to prevent the post from being overrun. Col. Russell Smith, 25th Marine Regiment commander, presented Nugent with the award. Smith was selected as the presiding officer of the ceremony since Nugent’s unit – the 26th Marine Regiment – had been deactivated. Thank you for your service and sacrifice, Mr. Nugent. This award for your Valor was a long time coming. I will share your story with my friends and family.